The Peterborough Police ABC team at Newark. From the left are Lucky Raja, Alfie Baker and Artur Tomasevic. 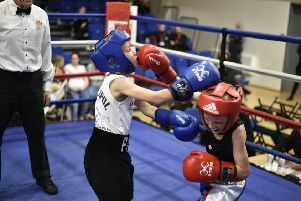 The Peterborough Police Amateur Boxing Club came to the rescue at the weekend saving a show at Newark. They got the call from Newark ABC at lunchtime on Saturday to say they were struggling following the withdrawal of several clubs and within an hour three Peterborough Police fighters were making their way up the A1. “I couldn’t say no to a desperate club whose show was falling apart,” said Peterborough Police ABC head coach Chris Baker. “I managed to find three boxers who were willing to fight at the last minute. Baker’s son Alfie was one of the three to make the trip but wasn’t actually scheduled to box . . . until another boxer dropped out at the weigh-in. Chris Baker said: “At the weigh-in Alfie was just spectating. However, when another boxer dropped out Alfie stepped in. Alfie (11) featured in a special exhibition bout at 55kg against local lad Sam Hardy. Both were national championship finalists and put on a quality display of boxing skills. “This was a very aggressive skills bout with awesome exchanges on the inside and at range. It was definitely the fight of the night,” said Chris Baker. Lucky Raja (11) from Peterborough also boxed a local lad, Deivids Paulauskas, in a 38kg skills bout and this was another classy contest. Peterborough heavyweight prospect Artur Tomasevic (19) from Welland boxed Luke Baker (23) from the host club and produced a cracker. “Artur was in beast mode from the first bell,” said Chris Baker. He cut his opponent within the first minute with crushing right-hand power shots and forced him to take a standing count of eight. He then pummelled Baker into a corner with a devastating barrage of punches to the head and body and the referee jumped in to stop the contest. It was the perfect warm-up for Tomasevic ahead of the International Box Cup Monkstown in Ireland this weekend where five other Peterborough lads will be in action.